Are You Ready to Do an Ultraman? USA Triathlon categories an “ultra” triathlon as any distance with a two-plus mile swim, a 62-plus mile bike and an 18.6-plus mile run. 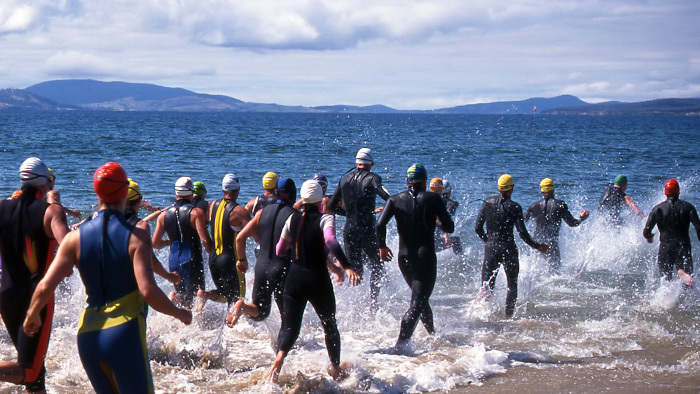 The most well-known of these types of triathlons is the IRONMAN. This distance is frequently marketed as the toughest single-day endurance event, and it has caught the imagination of many a triathlete’s big dreams. For those of us who have finished this distance, we agree. It is one tough day. But, there are other ultra distance triathlons that extend beyond 140.6 miles and a single day of competition. There is the Ultraman competition, which is a three-day stage triathlon, featuring a 6.2-mile swim and 90-mile bike on day one, a 171.4-mile bike on day two, and a double marathon on day three. Daily time limits are 12 hours. Then, there are a series of ultra triathlons that go beyond 140.6 miles, overseen by the IUTA International Ultra Triathlon Association (IUTA). Depending on the specific race, these ultra triathlons include continuous and one-a-day options for double, triple, quintuple, and deca triathlons. So, yes, you can go anywhere from 281.2 miles to 1,406 miles. And, yes, there is also such a thing as double and triple decas. A continuous race means once the race starts, the clock doesn’t stop ticking until you finish, and you do the entire distance of each discipline before moving on to the next discipline. So, a double anvil would be a 4.8-mile swim, followed by 224-mile bike, followed by a double-marathon. A one-a-day format means you do one iron-distance event each day. So, a one-a-day quintuple format means that you will do one iron-distance event (140.6) each day for a total of five days. In the United States, USA UltraTri has a series of double, triple and sometimes quintuple Anvils (a play on the iron-theme). The most recent of these was just held at Lake Anna Park, in Spotslvania, Virginia. Other U.S. locations include Florida, a race I’ve actually won twice, and Oregon. There are plans in place to bring a Deca-triathlon to Louisiana in 2018 (stay tuned!). So, maybe you are seeking this type of extraordinary experience and wondering what it would be like to train for double (or more) of the iron-distance. There isn’t a one-size-fits-all approach to training for any type of race. My goal is to offer an overview of the general principles, along with some examples of the types of workouts you might do to prepare yourself. To focus the discussion, I’ll provide tips specifically for the continuous double anvil, with the assumption that you have likely completed a single iron-distance triathlon, and may be contemplating the next step. Training for any race should begin with a basic premise: Your training should prepare you for the demands of the event. What sorts of training stress is necessary to be ready for a multi-iron distance event? Frequency and duration relate to volume. Your training history is the first place to start to determine an appropriate adaptation for volume. How you organize the activities within this volume depends a bit on your specific strengths and weaknesses, your athletic history and how much time you have weekly to train for the event. To set up the training load within each discipline, you want to consider where you specifically need to build endurance and strength. 4.8 miles of swimming (or more) can take quite a bit out of the body. To prepare for the demands of a swim that can take two or more hours, I recommend three to four days of swimming, building to swimming the full 4.8 miles, with weekly yardages in the 12,000+ range. The above workout can be adapted to be slightly shorter or longer, keeping the same premise in mind of working at race pace for the long sets, and then faster for the shorter sets. Preparing to ride 224 miles takes time. There’s no doubt about that. I recommend cycling three to four times a week, and building to a peak long bike of about 10 to 12 hours. Outside of that, your long rides can be in the five to eight hour range. Reduced load weeks should feature a substantively shorter bike. Because road safety is an ever-increasing concern, you can mix up your cycling training with road and trainer-based work. Since many of these races are also done on short loops (as short as five to six miles for the bike), you can mimic this in training, by selecting a short loop to do in training to prepare mentally for that style of course. And practice U-turns! You can also mix things up with dual-long bike days, riding four to six hours on Saturday, followed by another three to five-hour ride on Sunday. You get the same overall training load, but because it’s a little shorter, you can ride and run just a little harder to achieve a different training adaptation. While you won’t be racing at a hard effort, it’s important to train some intensity to ensure well-rounded cardiovascular fitness. When the volume is lighter in the earlier weeks of the training plan, you can insert some threshold or VO2max-style intervals, such as a classic 5 x 5-minute set, with three to five minute recovery intervals. As the volume increases, balance the training stress by pulling back on the high-end intensity. I recommend some “sweet spot” or tempo-style intervals, where you are working between 85 to 97 percent of FTP, for anywhere from 10 to 30 minutes. A classic version of this is 2 x 20 minutes, building from the bottom to the top of that range across the two sets. Recovery interval can be five to 10 minutes, depending on your fitness. Your main focus should be on building strength and durability. Be mindful about making the transition to ultra-distance running, and make sure as you add volume you are also working to improve your strength and durability for high mileage. Because running comes with a high-risk ratio, be careful how much run volume you pile on. Your peak long run could be anywhere from 20 to 30 miles. A good way to pump up your run volume is through frequent runs, so maybe you run four to six times per week – but half to two-thirds of those runs are relatively short. For example, you have a short run after your mid-week, shorter rides, a mid-range transition run after your longer bike(s), a hill or strength-oriented run after a mid-week swim, and then your long run. This allows you to build run volume without the big hit of a series of longer runs, which require more recovery. What might a sample week look like? Working increasingly longer durations at race-specific effort – which is going to be less than your IRONMAN effort. So, you are around 50 to 60 percent of FTP, or 65 to 75 percent of lactate threshold for running. The exact level of your intensity will depend on your specific strengths and experience. Practice fueling with real food. In long races, you’ll want to chew on something at some point. Practice with bike lights and head lamps. You will be running and riding at night. Be prepared for that! Train at different times of the day— especially if you are not used to racing in the middle of the night or in the wee hours of the morning. Given the training load and volume from the swim, bike and run workouts, it may seem impossible to include strength work. However, you can (and should) include a series of short functional-strength style workouts. I like to do a series of 15 minute workouts as part of my warmup, which you can download here. In these workouts, I focus on neuro-muscular activation, stability, and balance. Functional strength supports efficient form, works on muscular imbalances which can help reduce injury risks, activates inhibited muscles, and improves your stability and balance. These are all benefits that become especially valuable in the latter stages of a race that lasts beyond a single day. These races are much lesser known, and as such, it’s a tight-knit community. Many of the us know each other by name. This community feeling is one of the things that drew me to the distance, first as a crew member, and then as a racer. It would be a mistake to think of a Double Anvil as simply twice an IRONMAN (or a triple as three times and so on). While the numbers do add up that way, the experience is much more than numbers—whether we are talking about 281.2 or 1,406. Representative of these differences is the very language used to describe the center of the race. A triathlon has a transition area. The Double Anvil has a village. That’s more than just a semantic difference. Within the confines of that Anvil village–what I’ve called the Anvillage–lies the key to what makes this event so special: A sense of community that comes from pushing the edges of our comfort zones, sharing the belief that limits are for other people, and finding strength not only as individuals, but also as a community of people seeking the extraordinary.